When my boys were 3 and 2 years old, we took them to the beach. Each morning, we’d coat them head to toe in store-bought baby sunscreen. The brand was one that I considered more natural and safe. Everyday, about an hour later, they’d be covered in a rash that wouldn’t go away until I had given them a bath. I felt like I couldn’t win. They needed sunscreen so they wouldn’t burn, but the sunscreen was causing some kind of reaction. So I looked carefully at the list of ingredients and realized that this ‘natural’ baby sunscreen contained endocrine-disrupting and carcinogenic chemicals! Did you know that the rate of new melanoma cases has tripled since the 70’s? So in the past 40 years while we, as a society have stepped up our sunscreen game, we have managed to actually increase the prevalence of skin cancer. Could this be the chemicals in the sunscreen itself causing this increase? I can’t say for sure, but I’m not willing to let my family be guinea pigs when there are much safer and just as effective options. I am not saying that all store-bought sunscreen is unsafe, but I encourage you to do your own research into the chemicals in most of them. You can search for your favorite brand here and find out what is really in it and how safe it is. 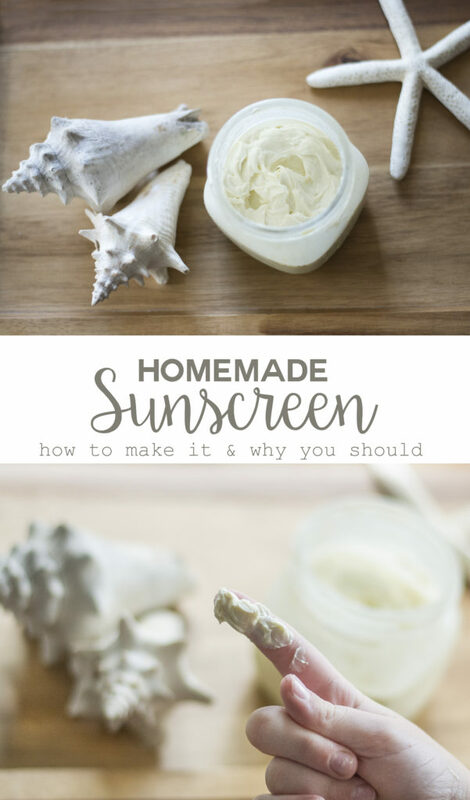 Homemade Sunscreen is actually very easy to make, only takes about 5 minutes, and contains no harmful chemicals! You’ll be able to make at least 4 batches of sunscreen with these ingredients, and way more if you get a second or bigger Shea Butter. In a glass jar, microwave beeswax pellets for 30 seconds. Add Avocado Oil and CoconutOil and microwave in 30 second increments, stirring between, until everything is melted and well mixed. Add Shea Butter and stir until melted (microwave for 30 seconds if necessary.) Add Essential Oils and Zinc Oxide, careful not to inhale the Zinc Oxide powder. Screw lid tightly onto the jar and wrap a towel around the jar to protect your hands from heat. Shake jar vigorously until well incorporated. Allow to sit at room temperature to form into a lotion texture. Note: Store in a cool, dry, and dark place. You can also, pour this into an empty roll-up deodorant or chapstick container which will allow you to apply it that way. Just make sure to label it! If making sunscreen is not for you, I recommend Badger Baby sunscreen or True Natural SPF 50 Sunscreen. In addition to sunscreen, there are some ways to stay safe in the sun this summer! Go out during the first few hours and the last few hours of the day when the sun is less intense. And don’t forget to take lots pictures and enjoy the good stuff with your family this summer!